Flying to London? You could spend three days in Amsterdam on the way for free or cheap. That’s the promise of AirWander, a new flight search engine for the adventurous. AirWander finds you inexpensive stopovers — essentially multi-day layovers when you can explore a connecting city between other flights. It can also help you plan multi-city excursions, stringing several flights together on a trip around the world. AirWander’s search engine launches today at the TechCrunch Disrupt London Startup Battlefield competition. To use AirWander, just punch in your departure and final destination city. It then suggests stopover locations where it can save you a ton of money versus flying to the two places separately. 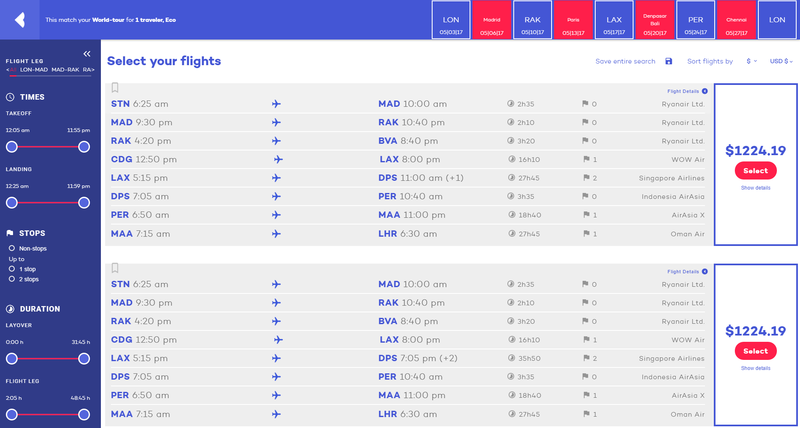 AirWander provides several sets of flight options that you can click through to instantly book. Alternatively, you can select a slew of cities and AirWander will find you the optimal route between them all. And if you just want to surrender to wanderlust, use the site’s “anywhere” option to receive recommendations for cheap but exciting vacations. Typically, this kind of trip planning can require tons of research, searches, spreadsheets and price calculations to get the cheapest fares. There are whole blogs devoted to mastering the complicated practice. But AirWander could take the work and mystery out of galavanting across the globe. AirWander’s founders built the product after enduring the effort of manually booking a trip around the world. After meeting at the Burning Man festival in 2013, Ela Bader and Douglas Deming spent seven months together backpacking through North and South America. They found with enough trial-and-error, they could hack the flight search process to score cheap stopovers. When they got back to San Francisco, they started building a tool to make it easy for anyone to travel like they did. Originally called QuestOrganizer, the startup participated in Spain’s Bolt accelerator, and then took a $25,000 seed investment from Hawaii’s Blue Startups accelerator. It reached 150,000 users. But now their team of eight has rebuilt their technology for scale and are launching it today as AirWander. The company earns referral fees from airlines for sending them customers. Next, AirWander plans to add user accounts so people can sign up for price alerts when a trip they want goes on sale. The startup will also be raising a new round of funding to pay for AdWords and Facebook ads to push growth. AirWander will have to battle it out with other specialty flight search apps like Kiwi for combining multiple airlines, as well as comparison engines such as Hipmunk, Dohop, Skyscanner and Kayak. AirWander is still a bit rough around the edges. It could do a better job of communicating its core value add around stopovers, and give examples of exactly how people save money on bonus vacations. While travel gurus might get the concept, novice adventurers will need more education on the beauty of stopovers for AirWander to become a mainstream hit. It will also need mobile apps to keep up with its competitors. The air travel industry still lacks transparency. Travel companies and airlines take advantage of how complicated the booking process seems. But with a little backend technology doing the laborious comparisons, services like AirWander can unlock a new way to fly. The more of the world you see, the more compassion you develop for the rest of humanity, and the more perspective you have on how to contribute.